The new USC Campus is scheduled to be completed by 2020. The campus is forecast to have 10,000 students by 2030 and expected to be a driver of residential dwelling demand in the region. The PDA allows for the development of 3,400 new dwellings. Other key projects benefiting the region include the Gateway Motorway North upgrade and the now completed Redcliffe rail connection. The Queensland Government has protected corridors to allow for the future expansions of the Ipswich, Spring- field and Salisbury-Beaudesert rail networks, following the completion of the Cross River Rail project in the mid- 2020s. A total of nine new stations are planned on the Ipswich / Springfield line and 11 new stations on the Beaudesert line. Upgrades to these lines are expected to boost demand for residential land in the Ipswich and Logan LGAs from the mid-2020s. 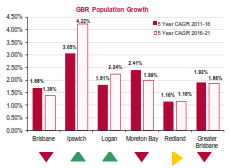 What will drive growth in Ipswich, Logan and Moreton? The key driver of demand in the Ipswich, Logan and, to a lesser extent, Moreton Bay regions is affordability. There is also a significant amount of private and public investment underway/planned which is improving the current and future liveability in these regions. In addition to the future rail upgrades, which are noted below, benefiting the Ipswich and Logan regions over the short- to medium-term will be upgrades to major road networks. The Ipswich Motorway is currently being upgraded between Rocklea and Darra and key areas of congestion on the Logan Motorway are being upgraded as part of the Logan Motorway Enhancement Project. What does this mean for Greater Brisbane? 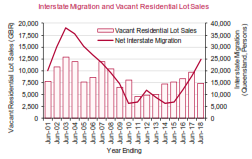 Growth in lot sales during recent years has occurred alongside a strengthening in Net Interstate Migration (NIM). NIM is forecast to strengthen further over coming years, driving residential demand. Ipswich, Logan and Moreton are forecast to ex- perience the strongest population growth which will lead to growth in lot pricing and englobo land. During the 2018 financial year, there were 7,358 vacant residential lots sold across Greater Brisbane. Ipswich, Moreton Bay and Brisbane accounted for the largest amount of sales. Demand for vacant land is expected to grow. We forecast annual vacant lot sales to increase to average between 8,500 and 9,500 p.a. (up from a five-year average of 8,040) from 2019 to 2021. Demand is expected to be strongest in the Ipswich, Logan and Moreton Bay LGAs due to affordability and continued improvements to infrastructure in these locations. Vacant land price growth is expected to be 5%-7.5% p.a. over the coming three years. 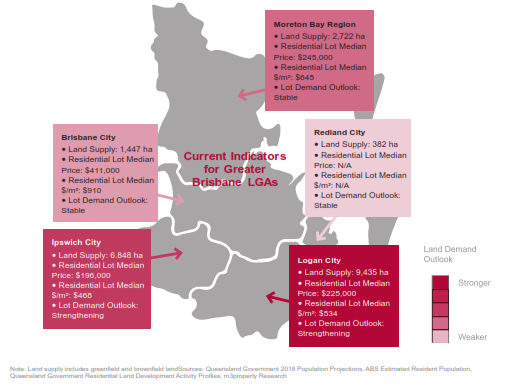 Ipswich is expected to experience some of the strongest price growth across Greater Brisbane – a result of recent growth in englobo land prices and forecast strong demand for vacant lots. The average price for englobo land was $524,722/ha in 2018, up 5.21% from $498,715/ha in 2017. From 2013 to 2018, compound annual growth for englobo land prices across Greater Brisbane was 5.47%. A significant portion of englobo sales during recent years have occurred in the rapidly-growing Ipswich LGA. Englobo land price growth to average circa 5% p.a. over the coming three years.